These cubs are about eight months old and still stay pretty close to their mother. Our spring and early summer grizzly bear trips travel up Knight Inlet and we start looking for grizzlies along the shore for that last half hour of an hour and a quarter boat ride. On this day we had changed in to the river skiff, which allows us to travel in the shallow water of the river before we saw bears. When in the river your guide is in the water pulling the boat up river and this permits a slow and quite approach to the bears. They are not frightened and this produces some amazing photographs. Bald eagles are viewed on all the tours from the lodge. 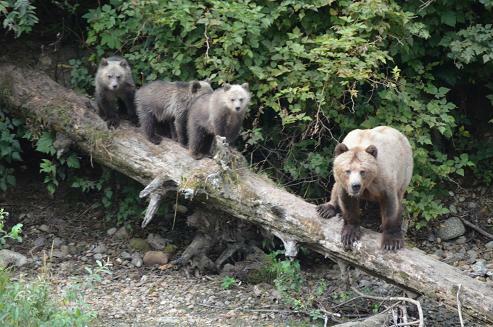 It does not matter if you are on your day trip to the grizzlies in the Glendale River, whale watching in the Johnstone Strait or on the river with Trapper Rick. In fact this picture was taken from the front lawn of the lodge on Minstrel Island. 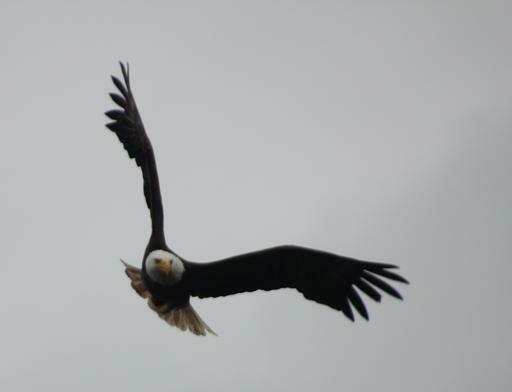 The bald eagles with their white head are a majestic bird when flying over head or perched in a tree along the shore.